Everything is looking up for boxer Adonis Creed (Michael B Jordan): after a string of victories, he’s just won the World Heavyweight Championship and gets engaged to his musician girlfriend Bianca (Tessa Thompson). But soon a threat from the past appears: Ivan Drago (Dolph Lundgren), the fighter who killed Donnie’s father Apollo in the ring, returns with his son Viktor (Florian Munteanu) to avenge his loss 33 years earlier to Donnie’s trainer Rocky Balboa (Sylvester Stallone). 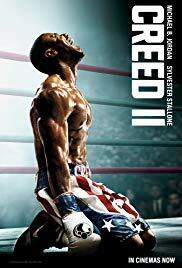 Creed II aka How To Train Your Drago I swear to flip, every time I go into these movies wondering why we need another Rocky sequel and leave with a big grin on my face and a lump in my throat. Jordan, Thompson and Stallone are still doing great stuff, but the surprise for me was Dolph Lundgren, who is really good as Daddy Drago. He’s not a cartoon villain; this time around, he’s got history and pain. When Rocky and Ivan meet for the first time in 30 years, it’s like watching Mickey Rourke in The Wrestler meeting Mickey Rourke in Iron Man 2. A dude in front of me at the screening was shadowboxing along with the final fight, and I do not blame him. Bring on Creed III, please, so I can hear the hip hop version of Eye of the Tiger.